Many years ago, a friend of mine and I were standing up to our knees in the middle of a small, wooded stream somewhere in the backwoods of the Adirondacks in New York State. He remarked that trout seem only to live in places of great natural beauty. That simple statement summarizes for me the only reason why I never lost my passion for trout fishing. Most of my professional life was spent as a laboratory-based scientist, trying to work out the details of life between a parasitic worm and its mammalian host. Along the way, I also became knowledgeable in the basics of stream ecology as it related to trout and their biology, since all my recreational spare time in the summer months was spent fishing for them. I have witnessed first-hand the beauty of my local rivers transform into not-so-beautiful places. Some have now been reduced to urban drainage ditches; sort of a reverse take on “The Ugly Duckling” story. Most of the ones that supported trout that were close to the place where I grew up fall into that category, unfortunately. Remarkably, these changes have come about over just the last 30 years. It is good to be reminded of the fact that one can still catch a wild trout in the River Test that still gently flows in the south of England. Izaak Walton, in 1653, first set down the principles of his philosophy that endure to this day (Figure 1). Actually, Walton’s Compleat Angler, or the Contemplative Man’s Recreation, plagiarized a good portion of Dame Juliana Burners’ original classic essay written in 1496, A Treatyse of Fysshynge Wyth an Angle, found in the second Book of Saint Albans (Figure 2). In those days, plagiarism was apparently a respected literary activity. My, how times have changed. Prior to the 1960s or there about, all that most of us had to do to get to a good spot on a trout stream was to drive several miles and start fishing. If we encountered anyone around the next bend, one usually could avoid actually running into them, and quickly found another spot of equal quality somewhere up or down the same river. Today, every angler, regardless of where they live, knows nothing else but the crowded scenes routinely found on most no-kill stretches of an ever-dwindling number of functional cold-water rivers. Ironically, the stronger our pursuit of pristine places to fish, the more we end up polluting the environment just to get there. Many of us travel hundreds, even thousands of miles to get to a quality piece of water, only to find it jammed with others looking for a remnant of solitude. Furthermore, it is not uncommon to hear stories about guides literally getting into fistfights over the right to cover a given stretch of prime water. Walton’s code of behavior has regrettably been displaced, shoved aside by a different, certainly more mean-spirited one, which not infrequently involves blatant competition between fishermen, rather than engaging each of us against the wiles of the fish. 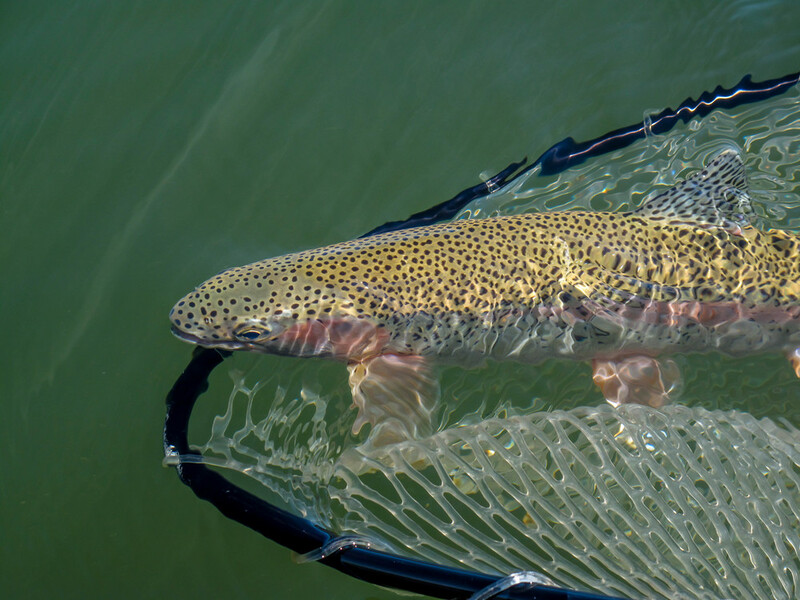 But in the end, despite the occasional bout or two of bad sportsmanship, most who fish for trout are good-natured soles simply seeking respite from their busy, urban/suburban lives. Can we return to a gentler, kinder sporting ethic? At the same time, can the public at-large become more active in the stewardship of our precious rivers and streams? I believe that if something is broken, its blueprints contain ample information, albeit implicit rather than explicit, regarding its repair. My intent is to write about the normal (i.e., functional) environment of where trout live, rather than produce another how-to-fix-it book. There is a growing stack of quality books on this subject (see Appendix II), with more to come, no doubt, in the near future. I will set down the basic principles of stream ecology in terms that can readily be understood. How can we help rehabilitate rivers that have had their very spirit broken by pollution, encroachment, acid deposition, and other industrial-age atrocities if there is no fundamental understanding of their ecology? Armed with a working knowledge of the basics of trout stream ecology, any dedicated naturalist/angler could simply by observation, decipher the natural cycles at work in their own home waters. Things that need improving will become evident once the normal functions of a river are understood. Numerous Trout Unlimited chapters have been very active and effective in stream improvement activities, and I salute their continued efforts to make trout fishing a national sport worth getting involved in. Whenever a bolded word is encountered, you can find its definition in the Glossary. Appendix I is a comprehensive list of all known salmonid species and their geographic range. The essays are mere “executive summaries” of a much larger body of information on each subject, interspersed with personal experiences that led me to examine closer those things that make up a river’s biological character. A mountain’s worth of original research literature exists on stream ecology and related subjects, and for those with a more scientific bent, I list in Appendix II a selected set of references on each topic. Many of these have been gleaned from the original scientific literature. I include images that I feel best illustrate a given aspect of the ecology of moving waters. My temptation is to show you all of them, since indeed, trout do live in beautiful places. Some essays emphasize the importance of the energy flowing into the river, while others describe the kinds of rivers that favor the survival, growth, and reproduction of trout. Hopefully all of this pictorial effort will go a long way towards obviating the necessity of relying heavily on excessive volumes of boring text. Finally, even though I’m now in my 70’s, I remain child-like, in awe of the trout stream and its life forms. Each time I go into the river, I go with as much hope and anticipation for the quest as I did during my beginning days as a fisher, or at least I feel that I still do, and in the end, that’s all that really matters. I remain a perpetual student in their classroom. 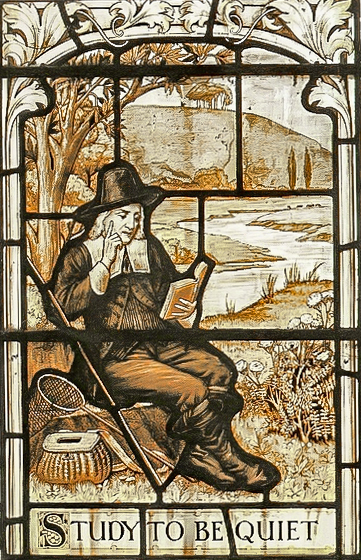 To achieve enlightenment while angling, Walton coined a motto: Study to be quiet (Figure 1). If we practice this simple behavior, then the ecology of the river will reveal itself to us and we will come to understand it on our own terms. My words on this subject will serve only to reinforce what is already a part of our sub-conscious awareness of the world around us; that we are all biologically and spiritually connected to all the other life forms on the planet, but especially to those special places that trout call home. We need to remain connected with them throughout our own natural lives.